Gold has Reversed. Will the Bounce Continue? Gold has been in a very strong downtrend until this past week. But thanks to this week’s bounce, gold has snapped its 6 week loss streak. Gold’s sudden surge on Friday was its biggest 1 day increase since late-March 2018. 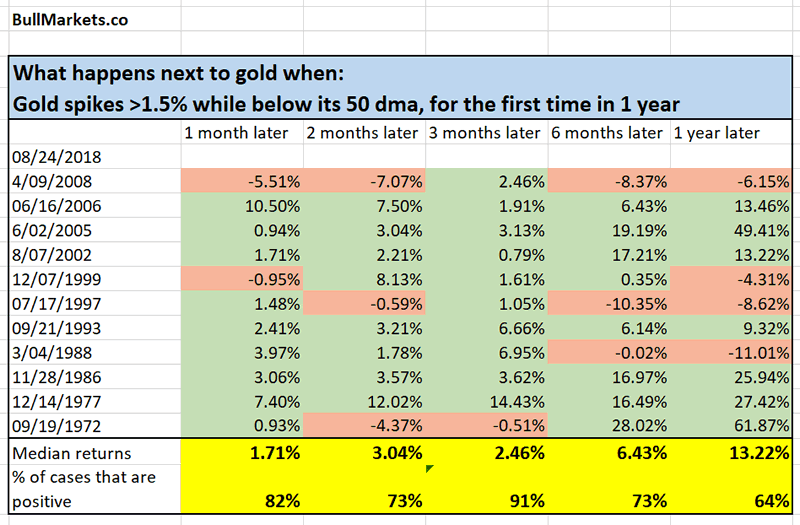 Gold spikes more than 1.5% (daily) while being above its 50 daily moving average, for the first time in at least 1 year. Gold’s sudden surge on Friday is a sign that its short term bottom is in. When gold suddenly spikes the way it did on Friday, it’s a sign that big buyers are finally stepping into the gold market to put a short term bottom under the market.